SIMTOI is developed by Dr Brian Kloppenborg of Georgia State University and distributed under an open source (GPL v3) license. If you encounter bugs, please file a report on the issue tracker. If you have specific requests for additional features, models, or other enhancements, please send an email To Brian (contact information on the SIMTOI project page). If you use SIMTOI for your work, please acknowledge it per the guidelines on the project's webpage. Several limb darkening models including Claret (2000), Fields (2003), logarithmic, power law, quadratic, and square root. Live parameter updating, model rendering, and data computation. 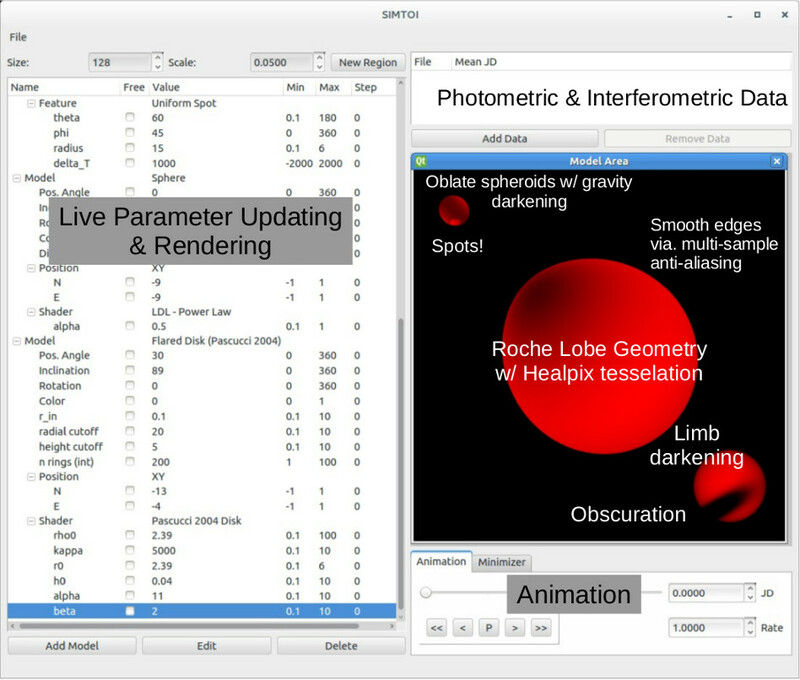 SIMTOI is designed to be cross-platform compatible. It has been tested on several variants of GNU/Linux and on Mac OSX 10.8. Test on additional platforms are most welcomed. SIMTOI requires that your computer have a graphics processor that supports OpenCL 1.0 (or higher) and OpenGL 3.3 (or higher). Almost any discrete graphics card by nVidia or ATI/AMD will meet these requirements. Intel integrated graphics provided by Fourth generation Intel processors (i.e. i3/5/7-4xxx) is presently experimental. See SIMTOI's homepage on GitHub for the latest requirements and installation instructions.